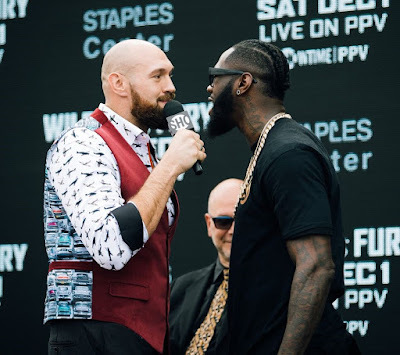 The year's most compelling heavyweight fight takes place on Saturday between titleholder Deontay Wilder (40-0, 39 KOs) and former lineal champion Tyson Fury (27-0, 19 KOs) at Staples Center in Los Angeles. Although this matchup doesn't feature the nominal number one in the division, Anthony Joshua, Wilder-Fury has captivated boxing enthusiasts, offering a fascinating style matchup between the knockout artist (Wilder) and the versatile boxer (Fury). The stakes for Saturday's fight are substantial: The winner stands to gain tens of millions of dollars for an eventual fight with Joshua. Fury, on his way up through the professional ranks, was often considered more sizzle than steak. Blessed with the gift of gab, his pre-fight press conferences were can't-miss affairs, but the bouts themselves could be humdrum or even sleep-inducing. In addition, Fury's clownish antics at times carried over into the ring where he sometimes would play around with lesser opponents instead of illustrating the menace that should befit a top heavyweight. Perceptions of Fury changed with his decisive victory over longtime titleholder and future Hall of Famer Wladimir Klitschko in 2015. Fury dominated with switch hitting, unconventional angles and psychological gamesmanship. Klitschko wouldn't let his hands go and Fury cruised to a comfortable decision (the fight was actually less competitive than the scores would suggest). But that was the last time Fury would enter the ring until earlier this year. In the interim, Fury suffered from depression and drug abuse. Fights were cancelled, drug tests were failed and Fury blew up in weight, with some reports suggesting that he was well north of 350 lbs. Fury did return to boxing in 2018, beating lesser opponents Sefer Seferi and Francesco Pianeta. Although he may not necessarily have impressed as he worked his way back into shape, he also didn't lose a single moment of either fight. Perhaps the smart play would have been for Fury to take another tune up or two prior to fighting for a championship belt, but he jumped at the opportunity for Wilder, who was unable to finalize a unification match with Joshua. Tyson Fury and Deontay Wilder holding court. Wilder has held a title belt since 2015 and although he has made seven defenses, only one of them, Luis Ortiz, was perceived as a real threat. Wilder was able to stop the cagey Cuban, but not before overcoming some rough moments. Ortiz was close to knocking Wilder out in the seventh round, but Wilder recovered, caught a second wind and scored a late stoppage. Despite possessing one of the best right hands in the sport and amassing dozens of TV-friendly knockouts, Wilder has yet to make a significant imprint in the greater American sporting landscape. Saturday's fight will be a chance for him to launch his career into a new stratosphere; however, Fury's considerable boxing skills are a serious threat to Wilder's future plans. So will it be the boxer or the puncher? Who will be the one with his hand raised on Saturday evening? Read below for the keys to the fight. My prediction will be at the end of the article. I have a feeling that the more composed fighter will win on Saturday. But what does that entail for each combatant? For Fury that means smart boxing. He needs to work each round and place his punches intelligently. In addition, he should employ effective neutralizing techniques such as stepping out of the pocket to reset the action and strategic clinching when necessary. Fury must remain consistent with his punch volume and effort. He will find it fairly easy to land on Wilder, but he will need to remain calm as he's having success. Fury must resist the urge to showboat or take unnecessary risks. Earlier in his career, light-punching Steve Cunningham dropped Fury with an overhand right during an exchange where Fury wasn't being defensively responsible. If Wilder lands that punch, it's unlikely that Fury would get back up. Fury will have a lot of good moments in the fight, but he can't be greedy. To use baseball parlance, singles and doubles will be enough for Fury to win; he doesn't need to go for the home run. Wilder must let the fight come to him. Eventually he will have opportunities to land power shots, but burning a lot of energy in pursuit of Fury or missing badly with haymakers won't necessarily be the answer to breaking down his opponent. Wilder can't force the action. If Wilder is overzealous in the ring, that will play into Fury's hands. The Ortiz fight illustrated the dangers for Wilder of rushing in without composure. Like Ortiz, Fury can be a crafty counterpuncher, and Wilder can certainly be hurt by short or odd-angled shots. It would behoove Wilder to establish his jab in the early rounds of the fight. Landing the knockout blow isn't vital during the first third of the match. Wilder needs to flash his power shots here and there and a well-timed connection could be enough to garner Fury's respect. Wilder must remember that the fight is 12 rounds, and there will be opportunities to land his best shots if he remains patient, vigilant and composed. 2. The Effects of Fury's Hiatus. There have been examples in boxing where fighters have been out of the ring for extended periods of time and have returned to succeed at the sport's top level. Muhammad Ali and Sugar Ray Leonard are two such examples. However, not every hiatus is created equal. Fury put on and subsequently took off over 100 pounds. That can take quite a toll on the body. Furthermore, it's clear that Fury wasn't in good condition psychologically during his time out of the ring. Fury should be commended for getting his weight under control for Saturday's fight. However, let's not assume that he has the conditioning to go 12 tough rounds against one of the top fighters in the division. Fury has yet to face serious resistance in his return bouts and there's no indication of how his mind or body will hold up under duress. This is one of the clear unknowns heading into Saturday's bout. Wilder's right hand is one of the best weapons in contemporary boxing. Big fighters, small fighters, short fighters, tall fighters; it doesn't matter. He's knocked out every opponent that he's faced (he stopped Bermane Stiverne, the only fighter to go the distance with him, in their rematch). Despite Wilder's powerful right hand, he's truly at his best when he's mixing in his other punches. At times his jab, left hook and right uppercut have been effective, but at other points his secondary punches have remained curiously absent, rendering him predictable and one-dimensional. Fury's a smart fighter with good eyes and reflexes. He certainly will be planning to neutralize Wilder's right hand, whether that means remaining in the orthodox stance so the punch will be easier to see or crowding Wilder so that he won't have the proper distance to throw it. For Wilder to make inroads in the fight, he will need to land something other than his straight right to divert Fury's attention, be it jabs to the body, double jabs to the head or short left hooks at close range. Remember that Wilder scored knockdowns in the Ortiz fight with three different punches (straight right hand, left hook and right uppercut). To be at his best, he can't just load up on right crosses and think that one punch will be enough to win the fight. It was certainly an unexpected move when Fury announced that he would be working without his uncle, Peter Fury, for his comeback. He selected little-known Ben Davison to be his cornerman. Davison hasn't amassed much of a resume as a head trainer. Thus it's unknown how effectively he runs a camp (or if he is even the one who is running it). Furthermore, Davison hasn't had big-fight experience as the lead in the corner. Does he make good tactical suggestions? Does he freeze up in crucial moments? Wisely, Fury and Davison recruited Freddie Roach to assist them in the corner for Saturday's fight (in fact, Fury even concluded his camp at Roach's Wild Card Gym in Los Angeles). With Roach's health having declined, he's not one to yell, motivate or give the type of tough love that Peter Fury was known for. I expect Davison to have a dominant role in the corner on Saturday. He's more familiar with Fury than Roach is and can communicate advice more resolutely. Davison must be given significant credit for overseeing Fury's weight loss during their three camps together, but it's still unclear whether the trainer will be an asset in the corner. Fury's singular focus was a major factor that led to his victory over Klitschko. That night he put it all together. However, that performance was not necessarily the general rule for Fury, who has been known to sleepwalk through rounds and switch off at pivotal moments. Fury's chin can be gotten to as well, and it will be up to him to protect himself throughout the fight on Saturday. If Fury is focused, he will see shots a lot more clearly and will be in a better position to absorb them. Furthermore, when Wilder starts to unload with power shots, that's where a switched-on Fury can capitalize with counters. The Fury who beat Klitschko was certainly an elite fighter, but there have been other moments throughout his career where he has resembled far less. His lack of focus has played a significant role in his differing versions in the ring. British boxing commentator Steve Bunce made an intriguing comment in the lead up to the bout between Bernard Hopkins and Joe Smith Jr. He said, and I'm paraphrasing, that unfortunately for Hopkins, Smith is too stupid to know any better. What he meant by that was Smith wasn't interested in the cerebral aspects of boxing. He was there to knock Hopkins out and wasn't likely to fall victim to Hopkins's mind games or psychological traps. In a fight where opinion was split leading up to the match, Bunce's analysis was spot on. Smith pounded Hopkins throughout the fight and ended matters by knocking him out through the ropes. For Wilder-Fury, I believe that a similar dynamic is in play. Unlike Klitschko, who loved chess and prided himself on his intellectual and cerebral attributes in the ring, Wilder is not cut from the same cloth. He's there to land his bombs and if he's losing early in a fight, so be it. He's not one to get discouraged or psychologically demoralized in the way that Klitschko was against Fury. Wilder has lost numerous rounds throughout his career. He's been down on the cards before. But he retains his self-belief throughout a fight. I expect Fury to win almost every round on Saturday. I think Fury will do very well...until he doesn't. At some point Wilder will land his Sunday punch, and like every fighter that Wilder has been in the ring with, Fury won't be able to withstand Wilder's best. Wilder's strong finishing instincts and his understanding that he will need to score a knockout to win will hasten Fury's demise. Once Wilder has hurt Fury, I expect him to go for the kill, and I predict that he will succeed. Power will eventually be the real separator on Saturday.